The Bitter Family Blog: Introducing the CULLEN FAMILY!! 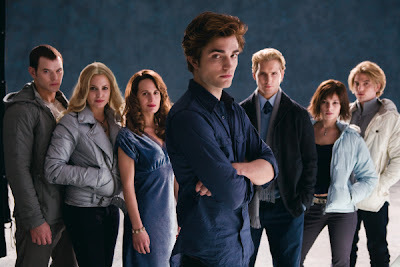 A huge treat for TWILIGHT fans!!!! PLEASE COMMENT AND LET ME KNOW WHAT YOU THINK!! OH HAPPY DAY TO ALL TWILIGHT FANS!! I am so not impressed with Edward! Actually none of them look anything like I pictured them. What a let down! Alice is the only one that is close to my interpretation. I am excited for the movie too, but this crew does not meet my expectaions! I think this will take a little warming up for me also but I am totally excited too! I already told my husband that I will be there at the first showing with all the other TWILIGHT frieks. I love that you love them as much as I do! I still haven't read the books. Sad isn't it? I know I'll be a freak about them though. Can't wait to read them and see the movie. Wait a second...is Esme the girl that plays Ava on Grey's????? This is the first I've seen the characters. Exciting! Thanks for cueing me in on that virus thing. Cathy- Thank you so much for posting this. I am heading to Stephenies web page now to see more details. I am so excited! I can't wait either! I would love to go to a midnight showing with you! Thanks again!